Ahh, the colors, sights and sounds of autumn! Fall is here, and with it comes one of our favorite festivals of the year: OgunquitFest. Lasting the entire month of October – so you can think of it as Oktoberfest – the festival is highlighted by a weekend of additional fun and activities. Some displays are funny, some are classic fall fun. At the Meadowmere, we really get into our fall decorations – with past Scarecrow’s ranging from a towering 30 ft witch with a cauldron of pumpkins to minions wandering thru a cemetery. 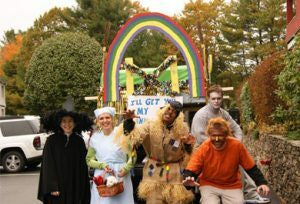 Travel to the town and see each of Ogunquit’s humorous and delightful scarecrow displays. The Meadowmere Resort is a long time fan of this amazing corn maze. A visit comes with opportunity for flash light tag at night — or day trip spent laughing together on an adventure . Surrounded by Maine’s own natural beauty, you’ll experience the best of Fall at this historic farm and corn maze. Shopping in Ogunquit is always special with unique items in the boutique stores. But for OgunquitFest more than 75 vendors come together at Ogunquit Beach. You’ll discover handmade crafts and artisanal products, plus a local farmer’s market with fresh foods and produce. The Bazaar makes for a great head start on Christmas shopping. Teetering on high heels and racing thru Perkins Cove, you’ll cheer and laugh the whole time. Why, you say? Because a trophy, prize money and the title of the high heel dash champion await at the finish line. All participants must wear heels of at least two inches and costumes are encouraged for extra laughs. One of OgunquitFest’s signature events, the Gourd Race pits 250 floating gourds against each other in a breakneck dash down the Ogunquit River. Each gourd only costs $5, and you’ll have a chance to win special prizes as well as half of the proceeds from the race. Still not sure about OgunquitFest? If you’re thinking of visiting our Ogunquit hotel in October, to enjoy a cozy cocktail by the pub fireplace or head to Maine for family fun, check out our OgunquitFest package and great hotel room choices with a central location.